Widely regarded as one of the best all-around vehicles in this test, the 2014 Honda Accord did not disappoint. Although it didn't stand out in any particular category besides fuel economy, we found the Accord to be feature rich, and overall it's a solid package. As it stood, the 2014 Honda Accord EX that participated in this test rang in at $26,470 and brought features like Pandora and Bluetooth, plus a clever right-side blind spot camera. Redesigned for the 2013 model year, the Accord continues to demonstrate that it's capable of balancing the best of both worlds. Ample cargo and rear legroom combined with an incredible ease to drive make the Accord a top choice in the segment. Spirited, fun driving is something the Mazda6 is known for but the Accord held its own in the twisty sections of our route. The Accord also has something the Mazda6 lacks, and that's loads of interior and cargo space. However, while the pass through space is big, we continue to wonder why Honda won't make the move to a split-back rear seat. As noted by multiple editors, the Accord's trunk is cavernous -- one of the biggest in the segment -- and can fit more than a week's worth of groceries for a family of five. Then there's the incredibly frugal 2.4-liter 4-cylinder engine which sipped fuel at an impressively gradual rate during the drive. Paired with a CVT, which is in a class by itself, the Accord EX has no trouble getting up to highway speeds. Trailing only the Nissan Altima, the Accord's front bucket seats are at the top of its class in terms of comfort. We logged countless miles behind the wheel of each car and never felt worse for the wear after climbing out of the Accord. Outward visibility from the driver's seat is second-to-none as well. There aren't a ton of knocks against the Accord but as good as the powertrain is, wind and tire noise could be dialed back a few decibels. Inside, the Accord boasts a clean interior with lines that draw your attention to a neatly designed center stack. A navigation screen sits at the top and has little trouble keeping sun glares at bay while another screen below shows what you're listening to. Many cars today have done away with physical knobs and buttons to control functions like tuning and volume but the Accord has not, and it even has duplicates on the steering wheel spokes so you don't have to reach. Overall, the 2014 Honda Accord EX consistently proved throughout the course of this test that it deserves to sit at the top of the midsize sedan segment. Whether it's the frugal powertrain, comfortable and roomy interior, or the cavernous trunk, the Accord is a solid package. How much should you pay for a new Honda Accord? How does its 5-Year Cost to Own stack up? Our Honda Accord Editors' Page is your gateway to answers. 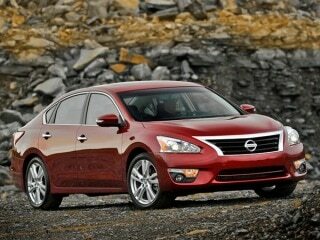 If you're still looking around, check out the other seven cars included in our 2014 Midsize Sedan Comparison Test.